Superior Twin Room – Room Only, Room Only. Phi Phi Islands, located just 45 minutes by speedboat from Phuket, offer a great laid back tropical life style. Soak up the sun, go beach hopping or simply enjoy the great outdoors in some of the most beautiful scenery in Asia. Classic white sandy beaches, surrounded by impressive limestone cliffs and sunlit crystal clear water, Phi Phi actually consist of two islands, Phi Phi Don and Phi Phi Ley. Transfers from Areas-Patong, Kata, Karon (If Hotel booked in any other location private supplement will be charged ). Guest have to pay national park fees on the spot. Note: Transfer on Private Basis should not be considered as vehicle at disposal. It only means that you are not sharing the vehicle with any other guests. Feel the most beautiful strip of sand on the earth! Krabi 4 Island tour is most popular tour one should opt for. Set out for most memorable trip of your holiday, experience clean, tranquil, clear blue waves and forget the world behind. Note : Transfer on private basis should not be considered as vehicle at disposal. 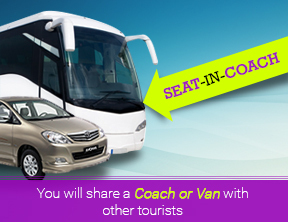 It only means that you are not sharing the vehicle with any other guests.